As I sat in lecture the other day, I came to the realization that my first final exam is less than three weeks away! Rather than procrastinating, I decided to plan out my study schedule for finals. 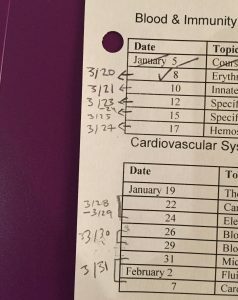 For this week’s post, I’ll be showing how I scheduled my studying for a cumulative exam, and will provide some tips for tackling the end of term. First, I write down all my exam dates in one place. You can find the final exam schedule here. 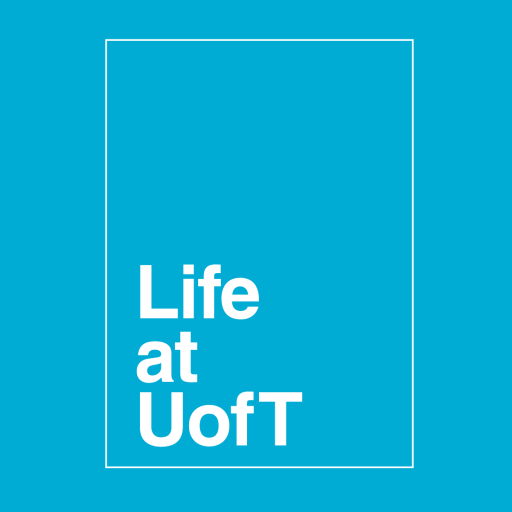 To make matters easier, you can see your final exam schedule by logging into ACORN using your UTORid. Just in case, it’s always a good idea to check both the final exam schedule and your ACORN account to ensure you’re not missing any dates. I make sure to plug these in my planner and phone calendar so I don’t forget! Before I make my day-by-day studying schedule, I take a look over the syllabus for my courses to see if there is an indication if the final is cumulative or not. This is my first moment in which I prioritize. If it’s cumulative, I know I need to spend more time studying in order to cover all the content of the term or year. 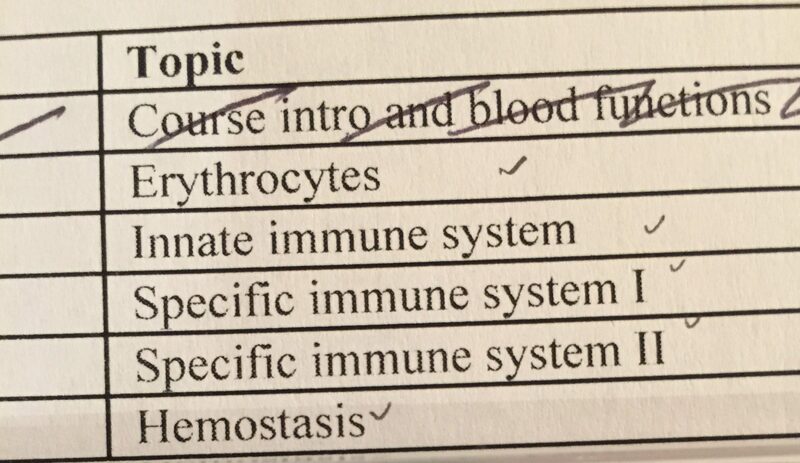 I also look for a lecture schedule in the syllabus, and I print it out to plan my studying schedule (if the lecture schedule is not available, I write it out manually). 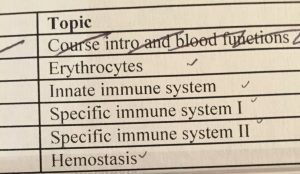 I learned this by experience: in my first year, I realized two days before the final I had not reviewed an entire lecture from three weeks before the end of term! If I had been better at planning my finals, I could’ve avoided this situation and reduced the unneeded pre-exam stress. 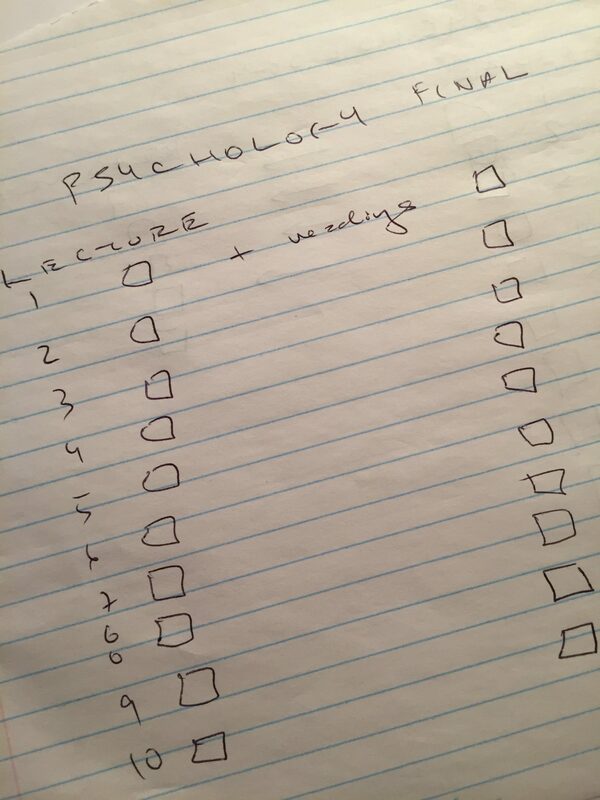 As pictured above, I started off by putting a small check mark next to all the lectures I already have made notes for. This means I have already reviewed these previously, meaning I can spend less time on these as well. As I prefer to hand write my notes, I do this to make sure I schedule enough time to write out my notes before the final. 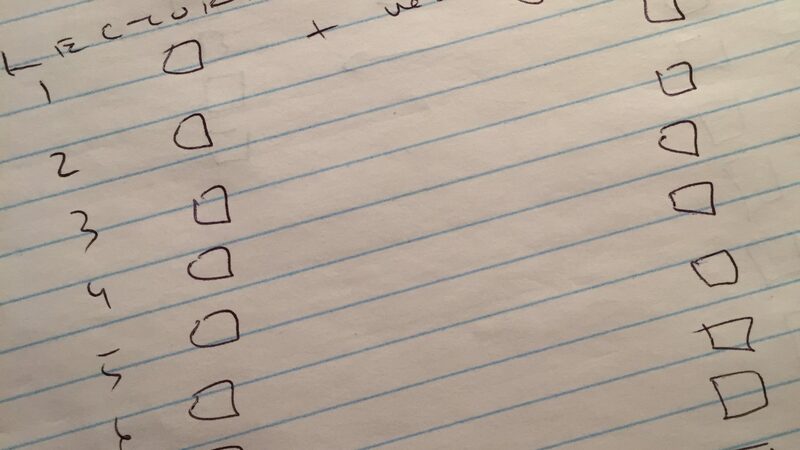 Although time-consuming, I attribute a lot of my success to my thorough note-taking methods! 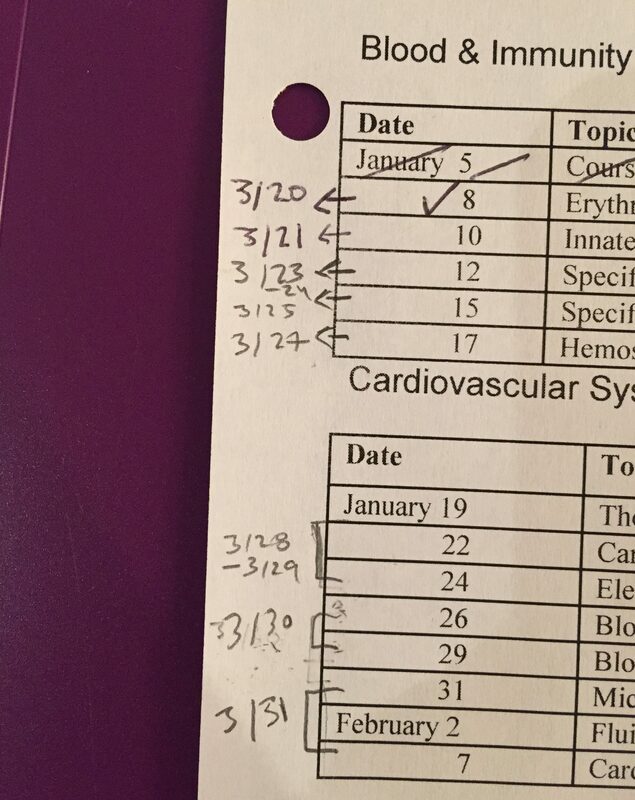 If do not have a lecture schedule on hand, you can write out the lecture and readings you need to review on paper. Next, I write down the days I will study each lecture. For this blog post, I decided to share how I plan to study for a cumulative exam for a half-year course. Planning studying for cumulative exams can be especially overwhelming as it feels like there is not enough time to cover everything! My final has over thirty lectures (three per week), which means that time management is key! In this sort of situation, I need to strategize about which content I need to spend the most time on. Although it depends on the course, I have found that new material tends to be a major focus of cumulative finals! As pictured below, I set my schedule so that the lectures that I am familiar with, such as the ones I was just tested on during last week’s midterm, will only take me a few days to review! Personally, I find it better to review the same lecture multiple times over the course of studying, rather than spending all day on one lecture and never seeing it again. For this reason, I have blocked essentially 2/3 of the course into a week and a half of studying. This lets me have more time to go over the new material which I have not had a midterm on yet. It sounds stressful, but front-loading my studying helps me have a few days to fall back on. As students we all can have “off” days, or something can come up at the last minute. Be prepared for this! And if it’s possible, try to take time to relax even among the studying: after a whole academic year of assignments, commitments and exams, you might benefit from getting some sleep once in a while. Prioritization has been difficult to master and is something I am still working on. My ultimate tip in this domain is to avoid spending too long on old content or material you feel you have mastered. I have found myself reviewing a lecture and suddenly becoming frustrated over a minor detail noted on slide 18. Dividing however much time you can commit to studying by the number of lectures you have is how I manage my time. Then, I’ll adjust the time spent according to my prior knowledge of the lecture and length of the lecture. 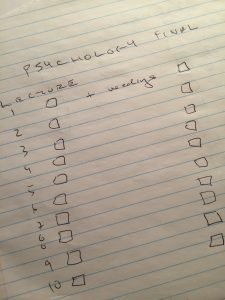 If you really dislike a course you’re taking, make a rough study schedule for that course immediately! I once had a course that I had no interest in, and I ended up procrastinating until the day before my final. This was a horrible decision on my part, and my marks dropped significantly from the exam. Learn from my mistakes, and make a plan no matter the course. To make the studying actually happen, and to help ease my boredom, I’ll spread out the studying for this type of course so it ends up being a lecture or two a day. Sitting down for an hour or two for several days is better than spending two full days on a subject you don’t enjoy. It’s no surprise that many of us students have both exams, final projects and potentially a term test in early April. As classes are still in session, I have been focusing on using final exam studying as change from working on midterms and papers. Even an hour or two a day spent on final exam material over the next week can make a major difference in your preparation once those papers are handed in, and it gives you a chance to ask for help! Although this is a stressful time of year, remember that you can still ace those finals and assignments! How do you prioritize during busy periods? Leave me a comment: I (and other readers) would love to know!